Montpellier, Musée Fabre, from 16 February to 12 May 2013. In little less than ten years, Eric Pagliano has published several catalogues of Italian drawings belonging to French museums and we have been fortunate to see all of the exhibitions surrounding them. After Orléans, Lyon and Grenoble, it is now Montpellier’s turn to benefit from his expertise. The result is, once again, remarkable. The art historian never settles for just writing traditional entries, describing rather in an extremely clear manner how he arrives at his attribution (ill. 1). We refer our readers to the preceding articles on these exhibitions where we attempt to explain his method. Here, he makes it even more obvious : an attribution is not just a matter of sensitivity. This is the most pertinent catalogue raisonné ever : indeed, it is a case of reasoning out the attribution (whether his or someone else’s), of explaining it by replacing it at the heart of the creative act, of justifying the different ideas which arise concerning a work and stating why he chose one hypothesis rather than another, while still remaining open to yet a different possibility. He does not hesitate in admitting his errors, using them to better understand the sheet and then come as close as possible to identifying the real artist. In this catalogue, Eric Pagliano pushes this method even further. He submits each drawing to a series of questions : what was its purpose, what was its place in the development of the final work (if there was indeed one), how did the artist use it to progress in his composition...? Pagliano takes the theories generally applied to literature and adapts them to graphic arts, notably that of the "dossier génétique" which consists in assembling all of the preparatory drawings and studies for a completed work in order to better grasp the finished product. Although he already used this notion in his previous exhibition in Grenoble, he goes even further here, thanks to the "dispositifs d’étude" (ill. 2) grouping the images of the works belonging to the same case and linking them in a logical way so as to understand how the artist achieves the final composition, with certain final works also associated together. We are aware of how difficult it is to explain this process clearly in just one article and we can only refer our readers to the catalogue itself. Thanks to the many complementary illustrations (most of the studies in question are accompanied by photographs of all the pieces in the same "genetic file") and, despite a slight tendency to use overly complicated terms (which he in fact puts into italics), Eric Pagliano’s prose is easy to read and allows us to fully understand his line of reasoning. Before taking a closer look at the collection in question here, we would like to point out that the Musée Fabre came up with the excellent idea of not just exhibiting its own holdings. Some sheets are accompanied by works borrowed from other establishments and quoted in the entries. Visitors will even find four paintings next to their preparatory studies and several brief scholarly analyses have also been prepared, highlighting some drawings. 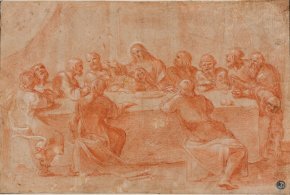 Thus, one of the most famous drawings in the museum, Raphael’s preparatory work for The Disputation of the Holy Sacrament (ill. 3) is compared to various sheets for the same composition from other museums, and Eric Pagliano’s method allows us, (the question of the attribution here is beyond doubt), to comprehend the finished product. The author devotes no less than sixteen pages to this case, proving that it is more than a mere exhbition catalogue. The holdings in Montpellier represent more than 500 Italian sheets, 99 of which - the most important ones - are exhibited and offer a complete entry ; the others are briefly catalogued and all are reproduced. Despite this titanic work, Eric Pagliano readily admits that other discoveries might come to light, notably as concerns the sheets looked at only briefly. In the meantime, the number of drawings which are published or attributed here for the first time is already very impressive : over one-third of the 99 pieces were unpublished and many have now received reattributions. Thanks to this work, the Musée Fabre has thus enriched its collections, for example, with a very beautiful preparatory study by Pietro da Cortona for an Adoration of the Shepherds (ill. 4) residing in Rome at San Salvatore in Lauro, with a Scene of Witchcraft attributed to Micco Spadaro (ill. 5) and a red chalk study for a Last Supper by Ludovico Carracci (ill. 6). All of these works - along with many others - had been overlooked in the important exhibition on 17th and 18th century Italian drawings of provincial museums, often because they were mistakenly classified in the 16th. 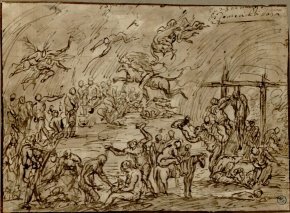 These drawings join an already rich collection of known works with three Raphaels, including a cartoon for Madone Tempi (ill. 7) from the Alte Pinakothek in Munich which unfortunately refused to lend it, thus depriving visitors of what might have been a fascinating comparison. 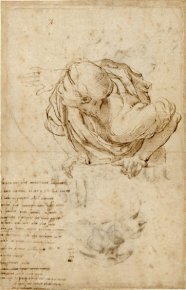 Still in the 16th century, though Montpellier does not have a Michelangelo, a very beautiful drawing by Daniele da Volterra (ill. 8) provides the opportunity to evoke his name in the show. This study of a man standing with a child, around which Eric Pagliano has created a dossier with several works thus qualifying it as a "dessin polygénétique" (ill. 2), ties together compositions by Volterra and by Michelangelo (one of which is repeated by Marcello Venusti). Here again, we refer our readers to the catalogue (indispensable for Italian art lovers) as we would fall far short here if we try to explain Pagliano’s rigorous but complex demonstration. In keeping with a tradition of excellent work since its reopening, the Musée Fabre is here again presenting an exemplary exhibition while at the same time pursuing the study of its graphic holdings, first started with French drawings. We strongly recommend those of our readers who can make the trip, to go to Montpellier and see an exhibition which is much more than a simple inventory, but also read the catalogue to better grasp a method which should be established as a model in the future. By applying reason to the work of attributions and relating it to the question of interpretation, Pagliano places this process at the heart of art history. After all, what good is it to interpret works and draw conclusions if the point of departure (that is, the author of the drawing or at least the context in which it was produced) is based on an error ? Curators : Michel Hilaire, Jérôme Farigoule, Eric Pagliano. Eric Pagliano, L’Atelier de l’œuvre. Dessins italiens du Musée Fabre, Snoeck, 2013, 464 p., 39€. ISBN : 9789461610799. Visitor information : Musée Fabre, 13 rue Montpellieret, 34000 Montpellier. Tel : +33 (0)4 67 66 13 46. Open every day except Monday from 10 am to 6 pm. Admission : 8€ (reduced : 6€).